Bamboo Blinds are a great choice to provide a rich warm and sophisticated look to your home decor. The natural beauty of reeds, grasses, bamboo & woods will add a natural organic texture to any style. Reeds have a tailored appearance and can be used in a casual modern or formal setting. They allow ample light to filter in and open up any room. Grasses are perfect for today’s casual lifestyle. Hand woven from natural grasses they are uniquely textured and incredibly versatile. The colours and weaves by Hunter Douglas are leading the market in style and add a casual feel to any room. Wood with its warm, rich colours and its timeless appeal make it the ideal complement to any decor. Bamboo with it’s’ strength and varied patterns will bring a casual earthy feel to any room. A symbol of both longevity and friendship bamboo is incredibly light, durable and beautiful and will add some serenity to your home. 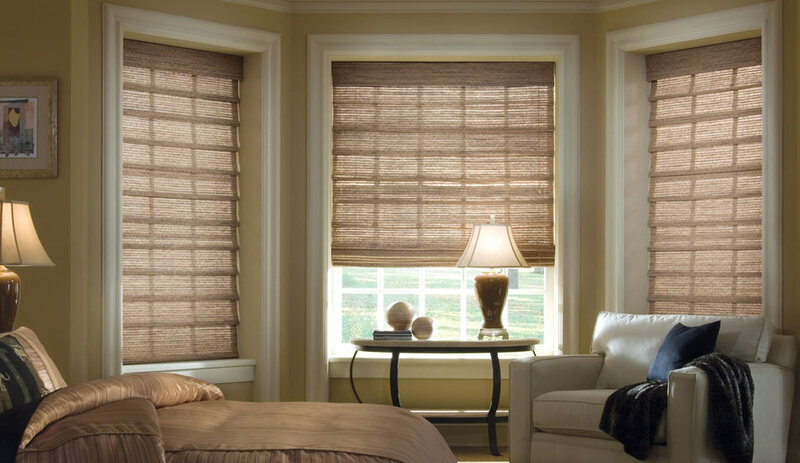 At Blind Advantage we can inspire and assist you in choosing from the over 77 combinations in the Hunter Douglas Provenance woven wood shades. Woven Wood Roman Shades come in 3 styles. Choose from the classic, hobbled or a traditional roman style. With the Traditional Roman style the fabric hangs flat when in the fully lowered position, and creates even overlapping folds when raised. They come with a colour coordinated lined valance. The Classic Woven Wood Roman is similar to the standard roman style, yet features fabric cascading from the front of the head rail instead of a valance. This gives will give your shade a more tailored, sophisticated look. The Hobbled style has the gentle folds even when fully lowered to provide additional texture and elegance. Choose a lifting system that best suits your needs. Many cord choices as well as motorization. Select from four styles of edge banding for a coordinated look that is unique to you. Add a liner if need more privacy and light control as they are available with a light filtering liner as well as a blackout liner. The “Top Down Bottom Up” feature is ideal for rooms that may require more privacy but want to allow in light. It is designed to open from both the top to the bottom and from the bottom to the top. The Two and Three on One Head rails is a great option if you have several windows that are side by side. A single head rail provides a cleaner look while allowing you to operate each shade independently. Come into the showroom today to see the other window coverings that we have to offer to you in addition to our woven wood bamboo blinds, or Contact us to book an in home consultation.